With this Belgium-made app it's easy to find new friends. It offers the opportunity to meet millions of new people around the world. He's chatting, helping make new friends. However, Twoo Premium offers extra features for a fee. With Twoo Credits, it is possible to increase popularity. - You can choose from a weekly, monthly, quarterly, six-month or annual Twoo Premium subscription. Prices may vary depending on the country. You can test the difference from other friendship applications by using the application. 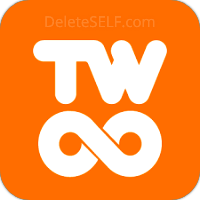 If you're tired of using Twoo or no longer want to use it, review the following account deletion link and instructions to delete your account. Just follow the link below to delete your profile. You have to enter your password and confirm.